Organised by Musei Civici Veneziani and the Tate Britain, the exhibition was curated by Ian Warrell, Collections Curator at Tate, and produced in collaboration with Venezia Musei. The exhibition brought together around 120 works (oil paintings, watercolours, as well as prints, maps and Turner’s Venice sketchbooks) that chart the intense relation between the great English artist and Venice, which he visited at various times between 1819 and 1840.The works dedicated to Venice exemplify especially important aspects of Turner’s art – in particular, his handling of light. Some of them being exhibited to the public for the first time, they offer one the chance to chart the development of the artist’s own personal poetics. The exhibition also provides an opportunity to compare Turner’s work with that of artists who were important points for reference for him – for example, Canaletto, Marlow, Caffi and Doyle. This was the first major exhibition devoted to JMW Turner’s trips to Venice. It spanned the twenty years between Turner’s first visit to Venice in 1819, when he was already forty-four, and his last in 1840. Even among Venice’s many distinguished artistic visitors, Turner remains one of the few to find a true echo of his own sensibility in the unique qualities of this sublime floating city. His career was remarkable for its successes and its innovations, yet his images of Venice were quickly recognised by their first viewers as some of his most magical, luminous works. Turner’s vision remains as vital today, expressing as it does the often inchoate and funereal qualities of the Venetian experience. The exhibition was organised in collaboration with Tate Britain , where it was shown during the autumn of 2003. Most of the works come from Turner’s own bequest, which was reunited in the Clore Gallery at the Millbank branch of the Tate in 1987 (the watercolours had were stored at the British Museum between 1929 and 1986). The Bequest contains all the works found in Turner’s studio after his death: some 300 oil paintings; plus all his watercolours and sketchbooks, which amount to more than 20,000 sheets of paper. It is only in the last thirty years that the full range of this material has received serious scholarly study, and as a result some works are only now being exhibited for the first time. During this period the Tate has mounted a long series of exhibitions exploring the diverse interests reflected in Turner’s output, charting his fascination with poetry, perspective and print-making, as well as his endless wanderings in Britain and on the Continent. J.W.Turner, Venice, the Piazzetta with the Ceremony of the Doge Marrying the Sea, 1835 ca. J.W.Turner, The Piazzetta and the Doge's palace from the Bacino, 1840 ca. J.W.Turner, The Porta della Carta, Doge's Palace, 1840 ca. J.W.Turner, Venice: An Imaginary View of the Arsenale, 1840 ca. Turner’s images of Venice are one of the most important aspects of his work as a mature artist. Although he spent comparatively little time there (less than four weeks in all during three visits) he built a very close association with the city, attracted partly by its literary and historical associations and the reputation of its painters, and partly by its own unique beauties. Paintings of the sea and the effects of light on water had always been important to Turner, so it was perhaps inevitable that he should be attracted by the city’s celebrated light, the result of its dramatic setting on a series of islands in the middle of a saltwater lagoon. Most of the works in this exhibition come from the artist’s own immense bequest, housed at Tate Britain, London. Very little of this material had been exhibited during Turner’s lifetime, and the majority of it was undoubtedly unfinished by the standards of the period, allowing us to savour Turner’s private reactions to his subject. The paintings he showed at the Royal Academy grew out of a profound enthusiasm for the city, and its enchantments cast a spell over his art for the last twenty years of his working life. The exhibition introduces here the variety of images which formed Turner’s ideas of Venice before he set out on his first visit in 1819. Above all, it was the work of Antonio Canaletto (1697-1768) which enabled Turner’s generation to feel they knew the city well even before they arrived. Turner, like so many other visitors, would have known Canaletto’s work mainly through engraved reproductions, especially a set by Antonio Visentini, published in 1735-42, focused on the Grand Canal, with other plates devoted to the city’s churches and public spaces. Turner acknowledged his debt to Canaletto in his first painting of Venice, which shows ‘Canaletti’ working (improbably) in the open air at his easel. But Turner never allowed himself to be constrained by Canaletto’s example; he absorbed principles from the earlier artist but, especially in his later work, he was concerned to produce something quite different. 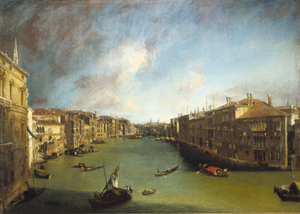 Canaletto’s example can also be felt in the works of other British artists of the period, including William Marlow and Richard Parkes Bonington, who exhibited in both Paris and London. Marlow’s painting provides an instructive example of the ways in which London and Venice were seen as related commercial centres at the end of the 18th century. 1840: 20 August – 3 September; stayed again at the Hotel Europa. It was Turner’s habit to sketch principally in pencil, especially if his time was limited (he claimed he could make fifteen pencil sketches in the time taken to produce one watercolour). This explains his somewhat cursory response to Venice in 1819, when he painted only four watercolours, though these brilliantly distil the effect of morning sunlight across the Bacino. Similarly the 1833 visit is documented almost exclusively in his sketchbooks, though some of the colour studies made on sheets of grey paper are likely to date from this visit, as they set out compositions which he later reworked as oil paintings. The final visit of 1840 was his longest and, therefore, his most productive stay in Venice. Turner’s contemporaries were well aware of his love of Venice; he exhibited as many as twenty-five oil paintings of the city between 1833 and 1846. But the true strength of his fascination only became known after his death. Ten sketchbooks, containing many hundreds of Venetian scenes, were found in his studio, as well as a large group of watercolours. These remain the most compelling evidence of Turner’s personal vision of the city. If Canaletto was one of the most powerful influences on Turner’s ideas about Venice, he was equally moulded by a number of literary sources. Above all Shakespeare’s Venetian plays – The Merchant of Venice and Othello – and Byron’s poems and verse-dramas. These works inevitably permeate Turner’s paintings and watercolours of the city. The final part of Byron’s Childe Harold’s Pilgrimage was published in 1818, just as Turner’s interest in the art, history and landscape of Italy was at its most intense. The poem may well have contributed to his determination to visit Venice for the first time. Turner’s reputation was founded partly on his images of picturesque ruins, so Byron’s evocation of Venice as a city still beautiful, though ‘Her palaces are crumbling to the shore’, must have had an especially strong appeal. In the 1820s, Turner produced two sets of book illustrations for the poetry of Samuel Rogers. These were immensely popular in the nineteenth century, introducing his work to several generations, including the young John Ruskin. When Turner began his career, in the 1790s, the London art world was entranced by the beauties of Venetian painting. The Peace of Amiens in 1802 marked a temporary halt in the war between Britain and France, making travel to the Continent possible. Turner went to Paris to study in the Louvre, which at the time housed many works of art appropriated by Napoleon’s troops. Some of these were taken from Venice itself, including works by Veronese, Titian and Tintoretto. Turner admired paintings which showed how landscape could play a vital role in the action of a painting, rather than merely providing a background setting. He was particularly impressed by Titian’s ‘colour and pathos of effect’, and attempted to assimilate the lessons of the master in his own pictures. The exhibition focused now more closely on Turner’s work, arranged to take you on a trip through the city, starting here with the monuments at its heart, in the Piazza San Marco, and its adjacent Piazzetta. Dominating these spaces are the Doge’s Palace, the Campanile, the highest bell-tower in Venice, and the Basilica of San Marco. The palace had been the city hall and courthouse as well as the residence of the Doge, the head of the Venetian state. The Basilica had once been the Doge’s private chapel, but in 1807 Napoleon made it the city’s cathedral. Many found its mixture of architectural styles incomprehensible: the poet Thomas Moore described it as ‘barbaric’. But Turner studied the outside during his first visit to Venice, and on later trips used dark brown paper to suggest the gloom of the interior and heighten the glinting of the mosaics. In the 18th century Canaletto’s images had contributed to a prevailing preference for the city seen in sparkling sunlight. But as its palaces crumbled and its canals became choked with weeds, poets such as Thomas Moore began to suggest that Venice became magical only when the ‘dimness of the light’ masked its decay. Turner only publicly exhibited one painting of Venice at night. His contemporaries were unaware of the large group of studies he had made principally for his own use, showing the city’s transformation by moonlight. Few of the drawings and watercolours shown here were considered worthy of being exhibited in public until relatively recently. During his final stay in Venice Turner seems to have used his rooms in the Hotel Europa as a temporary studio. The building is not the same as that which now houses the Hotel Europe e Regina (where Monet stayed), but lies closer to the mouth of the Grand Canal in the Ca’Giustinian, just behind San Moise. Turner’s windows looked out in one direction towards the Campanile of San Marco to the east, while from the top of the building he could look down across the canal to the Dogano and the Salute. The backs of several of these studies are annotated with notes by Turner that testify to his excitement in being the temporary possessor of these views. Ippolito Caffi (Belluno, 1809 – waters around Vis, Croatia 1866) was born in Belluno in 1809. He attended the Fine Arts Academy in Venice where he studied historic painting and Canaletto’s view paintings. A great innovator of Venetian view painting, he traveled extensively throughout Italy and sojourned from 1832 to 1836 in Rome, a point of convergence of landscape painters from all over Europe. Here, Caffi executed his splendid renditions of the ancient ruins, achieving exceptional results. This period was followed by travels in the Middle East and Greece and, in 1848, involvement in the uprisings of the Risorgimento, which would cause Caffi to spend several years in exile. During this time, he exhibited his work at The Great Exhibition in London in 1851. Upon his return to Venice in 1857, Caffi resumed painting with fresh enthusiasm, making effective use of colour and light in a series of images destined to become his most famous: serenades on the Grand Canal, S.Giorgio Maggiore, and the Venetian carnival, in which Caffi reveals his deep fascination with subdued light and nighttime scenes. The works included in the exhibit convey this expressive research. Turner devoted a whole sketchbook to a survey of the entire length of the canal. Other watercolours focus on the areas near the two hotels where he was based during his three visits: around the Rialto Bridge and along the Canal’s last great curve to the Dogano (or Customs House). As well as working from a boat, Turner painted some of his watercolours from the landing stages on the Canal. His views of the final stretch are dominated by the church of Santa Maria della Salute, its domes transformed by the afternoon sunlight and shadows. The Giudecca Canal separates the city from the homonym island. Turner had ventured briefly onto the Giudecca during his first visit to Venice, though he had only got as far as the church of the Redentore (Redeemer), designed by Palladio in the 16th century. It was not until his final visit, in 1840, that Turner really began to appreciate the spectacular views across to the heart of the city that the area offered. Earlier artists had largely neglected the Giudecca Canal, so Turner made the most of the opportunity to present the city’s familiar landmarks in striking new ways. Directly opposite the Doge’s Palace, at the east of the Giudecca, lies the island of San Giorgio Maggiore. Its buildings were largely conceived by the architect Andrea Palladio in the mid-16th century. Most striking is the church of San Giorgio Maggiore. Its campanile and dome appear repeatedly in Turner’s watercolours, viewed at times from the quays and canals of the city, but also seen from the water. He seems to have been particularly fascinated by the play of light on the brick and marble surfaces of the island’s buildings. Turner’s dedication put other artists to shame. William Callow admitted feeling guilty that he was lying around smoking in a gondola late one evening when he saw Turner in another gondola, still sketching San Giorgio. The Riva degli Schiavoni offers spectacular views of the Bacino di San Marco – St Mark’s Basin – and the city’s most famous buildings. It had once been the commerical heart of the city; ships from all over the world anchored here when Venice was at the height of its power as a trading centre. 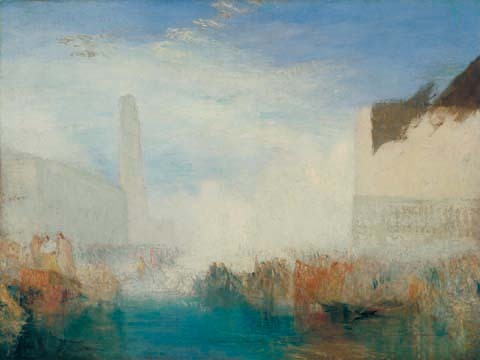 But by Turner’s day the volume of shipping had shrunk significantly and many mid-nineteenth century viewers could compare contemporary views of the Bacino with the vibrancy shown in Canaletto’s paintings a century or so earlier: Turner tended instead to focus on smaller craft, gondolas or the local fishing boats known as ‘bragozzi’. Byron described Venice as a jewel rising out of the sea, but surprisingly few artists tried to show its isolated setting in the vast expanses of the Lagoon. Turner seems to have been alone in developing a fascination for the profile of the city seen from the surrounding waters. His last images show it as a glittering silhouette, touched by the light of dawn or sunset. Some show arrivals or departures: we seem to be either approaching Venice with anticipation, or leaving it, watching it melt into the distance. The works in this final section were produced during the last ten years of Turner’s life. They divided the critics. Many who admitted to being entranced by his ‘beautiful and fantastic play of colours’ were disconcerted by the difficulty of making out forms and shapes. Several of these pictures remained unsold in Turner’s Gallery at his death. But seen here, as the climax of the exhibition, they show Turner maintaining to the end his determination to find new perspectives from which to challenge and enchant the viewer.